I had to get something pretty up so the snake wouldn't sit at the top of my blog creeping people out anymore. Eeek. It's ugly. But. 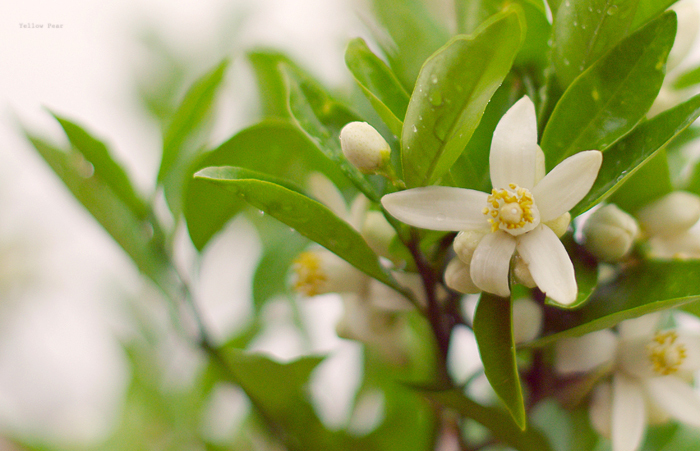 Have you ever in your life smelled orange blossoms? I know those of us in Arizona, Florida and California most likely have... but oh goodness, it is entirely a heavenly scent. I cannot even describe to you the sweetness that is orange blossoms. I cannot. Someday you must experience it if you haven't already. Put it down on your bucket list. I am serious. And here's hoping my oranges taste as good as their blossoms smell. Those are simply glorious, Lou. Do the blossoms smell citrusy at all or just flowery? I think I came close once to smelling an orange blossom. Guess I'll just have to fly out there and take a deep breath! Love the dew drops on the leaves too! T- They smell fruity and super sweet...not really like citrus. Just sweeeet. Thats my favorite time of year in Arizona...orange blossom time.